You are here: Home » Learn & Live the Faith » Apologetics » Why is There a Crisis in the Confessional? 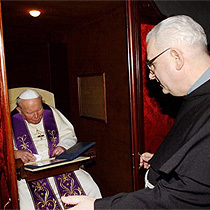 In my last column, we began covering the sacrament of confession by stating that modern Catholicism suffers from a crisis of the confessional. Here on this site, on social media and in emails, readers have shared their thoughts with me on why this is so. According to the wisdom of the crowds, the biggest problem stems from priests who do not emphasize the sacrament enough. Even worse, some actively discourage the celebration of the sacrament. One cannot deny that there is a lot of truth to this statement. True as it is, I do not find it sufficient. There are roughly 76 million Catholics here in the United States. If we were able to convince even five percent of Catholics here to go to confession, 3,800,000 souls would repent of their sins and quite possibly wind up in heaven because of our efforts. I am of the opinion that Catholics need to consider anew the nature of repentance in order to truly appreciate this sacrament. In doing so, we may also see why so few Catholics frequent this sacrament. When we call people to repentance, what exactly are we calling them to? I fear that repentance is watered down these days. To many, repentance simply means saying that we are sorry. While sorrow is certainly part of repentance, we need to acknowledge that there is so much more behind it! In repentance, we are reversing the mistake of our first parents in Adam and Eve. As everyone is aware, Adam and Eve ate from the Tree of Knowledge, and in doing so flagrantly disobeyed God. This part of the story is familiar to everyone. Yet I would like to focus on what happens after the sin. Adam and Eve go into hiding out of shame and fear. Eventually, God finds Adam and confronts him about his sin. At this point, Adam has a opportunity to repent. He knows he has done wrong, and one can reasonably surmise that he is sorry for what he has done. Sometimes one wonders what salvation history would have looked like had Adam immediately repented. Sadly, this remains a hypothetical. We know that instead, Adam immediately blamed Eve for his sin. (Genesis 3:12) He would’ve been fine, yet of course the woman, that vile temptress, had to go and seduce him away from the truth. In turn, Eve blamed the serpent for giving her those cunning words and leading her astray. God warned both Adam and Eve personally, and both chose to blame someone else for their faults. Ever since that dreadful day, mankind has become an expert at passing the buck. Everything is always the fault of everyone else, and we do not take responsibility for anything. When we repent of our sins, we have the opportunity to change the predictable course of human history. We also have a chance to be set free. While there will always be consequences of our sins, our repentance signals to God and ourselves that our sins do not control us. We aren’t just saying that we are sorry for screwing up; when repentance is treated this way, it is no wonder people don’t go to confession. Nobody wants to go over and over again doing nothing but telling a priest behind a screen how rotten they are. We should instead be going to the confessional to proclaim that we desire to be who God made us to be. Yet if we are going to get there, we need to be real with ourselves in admitting where we fell short. Most importantly, we are man/woman enough to admit we fell short, and desire to do better. We go to confession because God’s grace in that sacrament makes it possible to be who God created us to be. When we have that mindset, the priest assures us that God has forgiven us of our sins. How do we know? Because God works through the Church. I think this is why Christ’s first message was not to love one another, as important as that is. His message wasn’t to adopt a certain form of Judaism, as important as adhering to revealed doctrine is. Christ’s Inaugural message was to repent. (Matthew 4:17) Something magnificent was about to happen in your life. The Kingdom of God is preparing to make its abode in the castle of your heart. Yet if you are still stuck on your old ways and on blaming others, you’ll miss it. You will remain just like Adam, who in his selfishness failed to obtain what he was called by God to attain. Only through rejecting our former ways and affirming Christ’s ways can we truly be what we were called to be. I think if we presented repentance in this fashion, we might get at least a few more to the confessional.